Since we have a little lull in the action before the Belmont Stakes takes center stage, I thought it would be a perfect time to make mention of the remarkable Brass Hat, who won the Louisville Handicap yesterday in thrilling fashion. Now 8, Brass Hat had been winless since scoring the Massachusetts Handicap back in September of 2007. Although he was riding an 0-for-10 streak, trainer Buff Bradley was confident that the veteran was sitting on a big race. He was very pleased with his third-place effort in the Elkhorn at Keeneland on April 24, a race that came up very strong. In the Louisville, Brass Hat sack mid-pack through the backstretch and then was swung wide by red-hot Calvin Borel for his stretch drive. He collared both favorites inside the sixteenth-pole for a half-length score. It was his first win in eight starts on turf and his fifth graded stakes triumph. What an accomplishment for a horse that has overcome two serious leg injuries in his career. His earnings are nearly $1.9 million and would be around $3 million if he wasn't disqualified from the Dubai World Cup in 2006. His record is now 9-5-2 from 30 starts. This is one special horse. In talking with Buff after the Louisville, he and his father were very emotional, and rightfully so. The win came nearly eight years to the day when they foaled him. As Buff said, "we pulled him out of his mama and raised him. He is part of our family." Bradley said they will keep racing Brass Hat as long as he is sound and shows that same burning desire to run. They will, as they always do, pick his spots very carefully. Bradley mentioned the United Nations at Monmouth Park on July 4 as a possible next race. Don't be surprised if you see the old man racing beyond this season and into 2010. He is a fan favorite (here's a link to his web site); a horse that fans come out to the racetrack to see. We need more of these in racing. Congratulations to the Bradleys and Brass Hat. 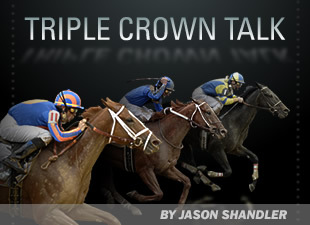 The Brass Hats of Thoroughbred racing are becoming few and far between. Please help me remember some of our older stars by listing some of your personal favorites. Happy Memorial Day everyone! *** By the way, I went with a Mr. Sidney, Smooth Air, Imperial Council and Riley Tucker tri box in the Met Mile.